This is the second of a four part series written for the Vernon Morning Star newspaper during a trip to Sabie in Jan – Feb, 2008. 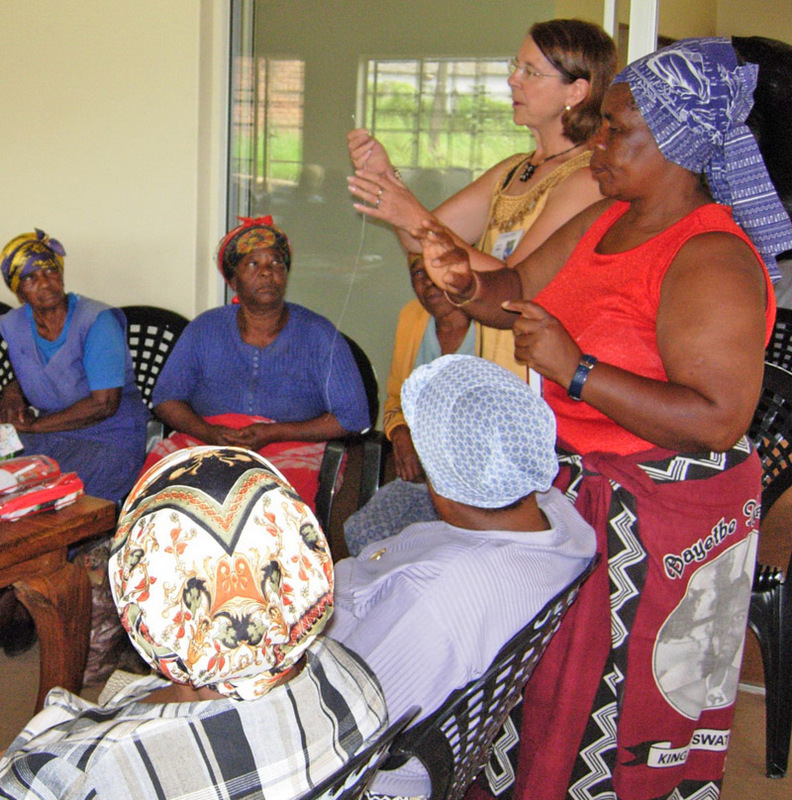 Excited to be in Sabie after a month of wonderful experiences in other parts of South Africa, I arrive early on Friday morning for the first session of sewing with the gogos (Zulu for grandmothers) at Ubuntu Community Centre. Imagine my surprise to be welcomed by exuberant singing and clapping, colourful dance and fervent prayer, all for our benefit! It was such an overwhelming experience that we felt close to tears at the sincerity and friendliness of this gesture. After such an exceptional welcome, we start with the plans for our stay – our own welcome from Vernon’s Grannies à Gogo, and suggestions for the coming days. 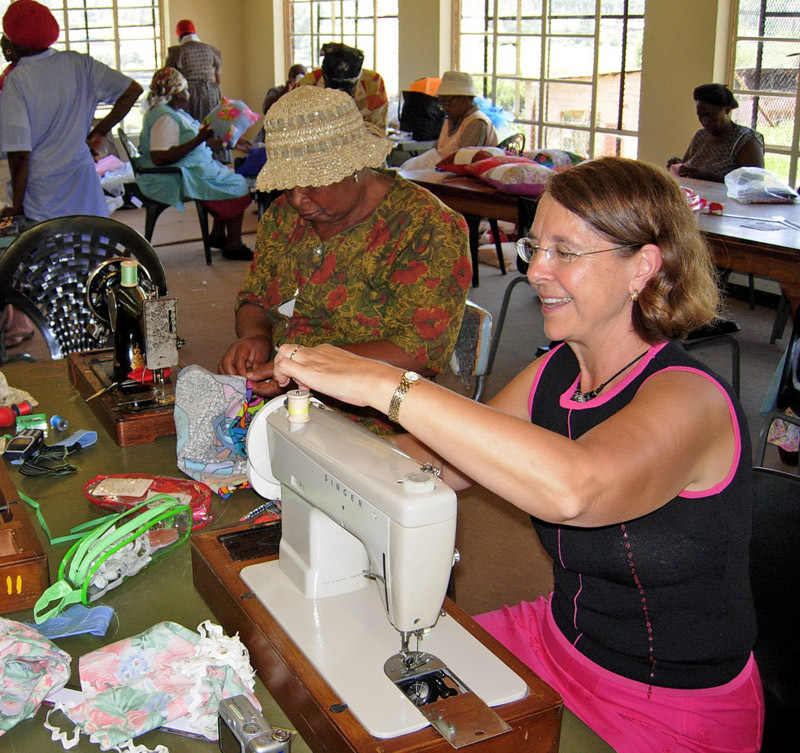 We are about to embark on a sewing project for the elderly women who are raising their grandchildren, often because the parents have died of Aids. Aprons, oven mitts, skirts and bags are mentioned and the church banners already requested. All ideas being approved, we quickly get to work handing out sewing kits and fabric so kindly donated. Susan and Ken Fenner, my friend Pauline (from Victoria) and I, brought four cases full of fabrics and sewing supplies. These supplies were generously donated by various groups and individuals in and around the Vernon and Armstrong communities. Ainah comes up quietly. The lines on her face and worn hands indicate the hard and diligent work of an 83 year old woman. “Please, you have bigger needles? My eyes are not good.” I go to the central supply of needles and pins and choose a large needle with a big eye. “Thank you”. She is jubilant and returns to her spot to do lovely neat hand stitching on the brightly coloured apron she is making. I am reminded that these ladies have probably never seen or used such interesting fabric – it is a joy to watch them sort through and look at the pieces. It is sad to realise that many have poor eyesight and are without much needed glasses. Our South African gogos are so grateful. Marjani comes up and gently confides, “God will bless you all for coming to help us and care about us.” I assure her that we are happy to be here, but my simple explanation seems inadequate for the enthusiasm we are seeing. During our first three days working at the Centre, we have worked hard to keep apace with the ladies and their desire to make as much as possible. Machines were introduced, after being repaired, but are of such poor quality that they frequently break down. Hand sewing is popular, and it is amazing to see the patience and dedication shown in finishing a project by hand. Banners have been started, and will hopefully decorate the various churches that the ladies attend. My first impression of this gogo community is of great hope. Hope that once the ladies have seen what can be accomplished, they will have the desire and energy to continue. Hope that they will be able to form and continue a cottage industry in order to improve their lives. Hope that their Canadian friends will help them in our short stay, to do what we can to share our wealth and experience for their benefit. The friendships and camaraderie already made has been heart-warming. I feel a kinship to many of these gogos, and feel privileged to be here in South Africa working with them.